Small caps have been an upside leader in 2018, as they are very near all-time highs. 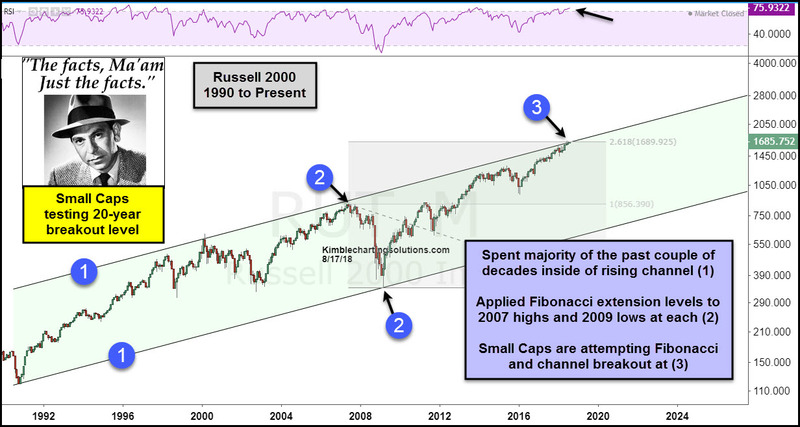 We applied Fibonacci extension levels to the 2007 highs and 2009 lows at each (2). Joe Friday Just The Facts Ma’am- Small caps are attempting a dual breakout at (3). This is a price point that small-cap bulls would LOVE to see strength and a breakout take place, as monthly momentum is lofty. The iShares Russell 2000 Index ETF (IWM) closed at $168.35 on Friday, up $0.72 (+0.43%). Year-to-date, IWM has gained 10.68%, versus a 7.25% rise in the benchmark S&P 500 index during the same period.